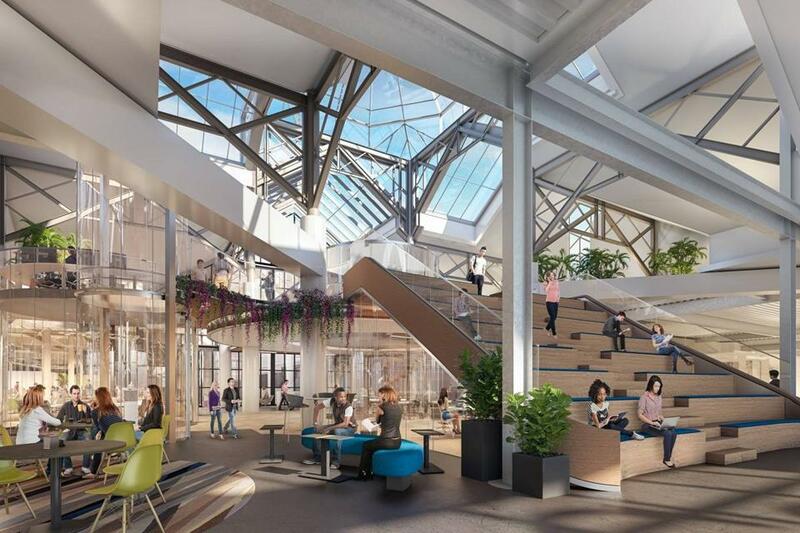 An artist’s rendering of what the third floor of the CambridgeSide mall will look like after it’s renovated for use as office space. Soon, people will be working on the top floor of one of the region’s busiest malls. New England Development plans to start work in May on converting the top floor of CambridgeSide, the bustling East Cambridge shopping center, into about 140,000 square feet of office space. Stores on the lower two floors — and a section of the Macy’s department store on the third floor — will remain open during and after construction. The project, which is expected to wrap up early next year, reflects the realities of the national retail market, as well as the office market in red-hot East Cambridge. Even with a $30 million makeover done just last year, New England Development has said that stores on the third floor of CambridgeSide were struggling to draw foot traffic. But office space in buildings near the mall, which sits just a few blocks north of Kendall Square, is being rented for huge sums of money. That’s why it makes sense to swap out some of those stores for office space, said the developer’s president, Douglass Karp. Brokers say they expect the space to be leased quickly in an area where the vacancy rate for offices is under 1 percent. It is “unlike anything else available in the market today,” said Pete Bekarian, managing director at the real estate firm JLL, which is handling the leasing. And it may be the beginning of even bigger changes at CambridgeSide. New England Development is set to unveil plans next week to add at least 600,000 square feet of new buildings at the mall, particularly along First Street at what’s now an above-ground parking garage and a shuttered Sears store. At a meeting Tuesday with the Cambridge Planning Board, the company will launch a review of zoning that would enable a series of buildings — featuring office and lab space, housing, and ground-floor retail — that it says would “activate” First Street and improve access for pedestrians and cyclists. The buildings could be as tall as 135 feet in places, and at least 20 percent of the project must be housing, according to preliminary plans filed with the city. No timeline or cost for the larger project was immediately available. But it would put New England Development in a position to capture more of the growth that is rapidly filling in the section of East Cambridge between Kendall Square and Cambridge Crossing.